5-min drive to Suntec City and 10-min drive to Orchard Road and Raffles Place. Breezy neighbourhood as the East Coast Park and beaches are nearby. Expats prefer Pebble Bay but the rentals at Casuarina Cove are more affordable. The condo is lower density. or tel: +65 9668 6468. Wants a new condo with a big terrace. 8.45am Shaw Plaza-Twin Heights penthouse 4+1 5000 sq. ft $6,500. 22nd and 23rd floor. Unique floor plan with large living areas, large perimeter balconies and an open-air bathroom in the master bathroom. Very high ceiling and large balconies off the living, dining and bedrooms as well as an additional outside balcony for barbecue parties. HDB views. District 20 location not a Caucasian expatriate area but this was the best of all 40 units seen with several agents. A 10-minute drive to Suntec City and the American Club. Email: judy@asiahomes.com, tel: +65 9668 6468 if you wish to rent or buy Shaw Plaza Twin Heights condo. 9.30am Pebble Bay 4+2 2626 sq. ft $7,500. 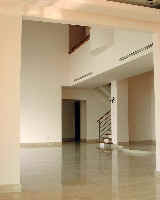 Lobby N. 4th floor facing bay but 3 bedrooms at the back face construction. The husband was not keen on this high density condo. 9.45 am Camelot 3+1 2700 sq. ft $8,500 (ground floor with big patio facing pool). Liked this unit as the patio was around 300 sq. ft. There may be a lack of privacy as the unit faces the pool. Camelot 4+1 2400 sq. ft $8,500 (4th floor, bay view from bedroom and pool view from living room and big balcony). 4 units left for rental. Almost full house. Said to have around 25 children in condo. The husband liked this condo. It did not blue bathrooms and a lap pool of around 50 metres long. Cool sea breezes present. Grange 70 ground floor 4+1 2333 sq. ft $8,000. Has a patio. 8-min walk to Orchard Road. Upscale. 20 units only. Patio faces Grange Road. Living room is not the standard shape. Pebble Bay penthouse 6+1 6000 sq. ft.
Hillcrest penthouse 4+1 2750 sq. ft $7,500. Fully renovated. Parc Stevens 3+1 1900 sq. ft $8,000 (ground floor with wooden deck patio). Low density condo. Bedrooms are small as expected in newer condos. Oleander Tower penthouse 4+1 2555 sq. ft $7,000. Trellis Towers penthouse $9,000 - $11,000. Pebble Bay, an upscale condo with high and low buildings, is on the left, by the Kallang River. Parkshore condo is on the right. Tanjong Ria and The Waterside are in the distant background. Casuarina Cove will be behind Pebble Bay. Costa Rhu will be in the foreground (not seen), at the end of the vacant piece of grass land. The Kallang River is on the extreme left of Pebble Bay. A suspension bridge crosses the river connecting to the Indoor Stadium.